We miss the voice of Melissa Lyons.. . HD Wallpaper and background images in the Filem Barbie club tagged: melissa lyons.. This Filem Barbie fan art might contain potret, headshot, closeup, and headshot closeup. I want her sing in the new movie Barbie!! I will sure to miss her! I wanna kill Diana! I miss you Melissa Lyons. Wait, she's gone, too? Why are they getting rid of all these talented people? True! Why I don't know about it nothing? Aha, maybe, because Diana is 2-in-1, singer and voice actress. But OMG, where is prooflink? Barbieboonchit!!!!! Tell me, what's happened? 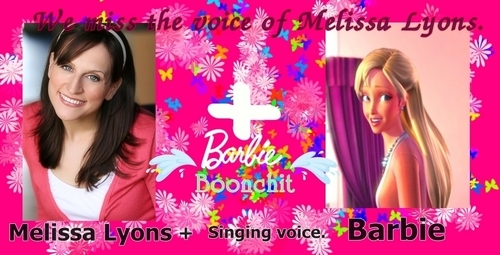 And why Melissa= Barbie? Barbie in FF wasn't a singing character. Also, if Melissa wasn't in Fairytopia, Barbie Diaries, Mariposa...we weren't think, that she was fired. Maybe, she has concert tour and has no time to sing in BM. Or something else? It's not necessary to shout everywhere: WE MISS MELISSA without reason, but it's very necessary to shout: MATTEL HIRE KELLY BACK, because it has a biggest reason ever. i wanna kill Diana too! Well, if you don't know, it may be rumor. But why need to make something, what based on rumor? OMG! As I said, it's not necessary to shout everywhere about something untruth. OMK kill me, people. What will happen with all your thoughts, when Melissa's voice appear in FS? Ha-ha-ha. Please come back Melissa.We feel so miserable without your singing voice. I really wish.OK let's do it.Great idea.